Safer mobile day ranging for your flock. Keep your hens out of the flower beds. Harness hen power to prepare your garden spaces. Use our coop as a breeding enclosure. Acclimatize new hens. Looking around on the internet, we noticed two things: 1. Most other chicken tractor makers don' t tell you how much their coops weigh. 2. Some other coop makers quote a price and then charge extra for all the rest of the stuff you will need, thus boosting your final price. Heavy structures are hard to move. Our Happy Chicken Tractor weighs 35 pounds and moves with one hand. Our price is our price. Everything is included - feeder, waterer, perch, shade cover, ground stakes and wheels. No up-sell. We though you'd like to know that. We sell more space for more chickens for less money. Period. 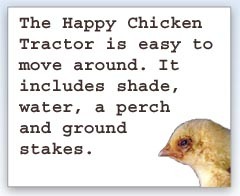 The Happy Chicken Tractor moves easily. Includes ground stakes for extra security. Durable aluminum construction. Entirely made in Massachusetts, USA. NOTE: We built several of our coops with welded wire and found it to be a very unfriendly material. 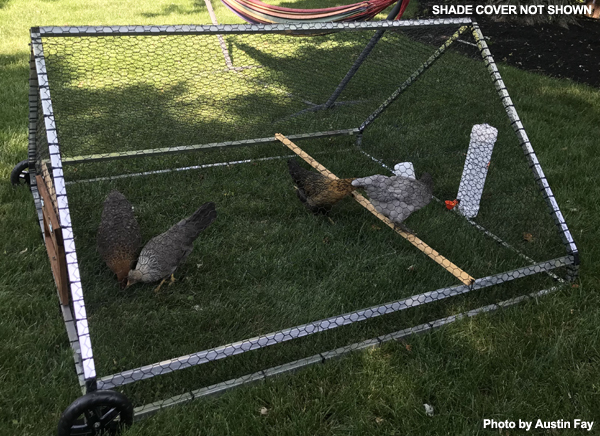 Our choice of durable coated steel chicken wire provides excellent predator protection without sharp edges to cause problems. Feel free to use our coops with the wire panels of your choice. We are happy to ship our coop with no netting (save $50) and you can cut and attach your own netting. Specify "frame only" when ordering. Our standard model is 5 feet wide and 6 feet long. 2016 prices -- same as 2015. The Gardeners' Friend: Why should you do all the weedy work? Why not harness the power of your hens to weed, aerate and fertilize the garden, one plot at a time in a Happy Chicken Tractor? When one plot is done, just move the hens on to a new one. The Happy Chicken Tractor comes with a shade/rain cover, wood-frame door, drinker, a tray or jar feeder, handles, a perch and ground stakes to pin it down on windy days. No tools needed. Move it with one hand. No predator reports. 300 Customers in 40 states. 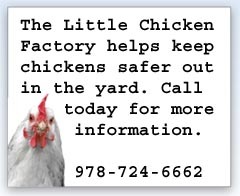 TO ORDER A CHICKEN TRACTOR, CLICK HERE TO E-mail us today or call 978-724-6662 and speak to a human. WE WILL SEND YOU A MONEY REQUEST AND WE USUALLY SHIP UPS GROUND IN JUST ONE DAY. We've added an optional "floor." Chicken tractors usually have no bottoms so the flock gets access to the ground below. But several customers worried about burrowing predators have asked for a full wire enclosure so we have added an optional "floor" panel of coated wire. The optional panel just attaches to the bottom of the coop and still allows contact with the ground below. Ask for details. We don't just "like" Eddies Wheels for Pets - We LOVE them. Go here and see for yourself. CLICK THIS LINK NOW! STORMY WEATHER: A customer in VA called the Little Chicken Factory the other day after hurricane Sandy. Here's his message from the voice mail. Hello, this is John Baker in Virginia. A big old tree fell on my Happy Chicken Tractor and bent it down a fair way, so I need a replacement part for it. Actually it held up pretty good except the ridgepole got bent down a little bit. I'm amazed at how strong that thing is. The chickens are fine. This is the second time this has happened, once in Massachusetts and now in Virginia. No chickens were harmed. A replacement ridgepole is on the way. The "Completely Coopy" t-shirt is here now! Buy one for your friend who Really Loves Chickens. We mail it for free. Heather or Nantucket Red. More colors soon. L - XL. $24.95. Kate Morreale of Golden Egg Farm in Hardwick, MA. 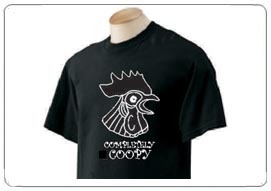 Proclaim your love for chickens with our "Completely Coopy" T-shirt. Buy one for a friend who really likes her chickens. Proclaim your passion for poultry and make a fashion statement at the same time. What could be better than that? Just $20.95. Free mailing. My chickens love the tractor! It allows them access to fresh grass and weeds every day. I love it too. I feel very secure leaving them outdoors during the day even with all the predators we have here. We are surrounded on all sides by woods and fields with hawks circling overhead daily. My mail carrier recently asked me how many chickens I've lost. I said none. She was amazed because so many in my area lose their birds to coyotes and fishers. I don't leave the chickens in the tractor overnight - they go into the coop - but even when I have to be away all day, I don't worry about them. Thank you for such a great product! If my chickens could write you a thank you note, they would. The tractor gets them out daily, and protects them from my dogs and the hawks overhead. My next door neighbor free ranges her chickens, and she has lost them to hawks, a coyote, and yes, to dogs too. She needs a tractor! If one of our coops saves just one laying hen from a predator, it could save 150-200 eggs to feed a child or a family. Read MORE to learn about our plan to make a difference in places that matter. Have you lost a free-ranging hen or small flock to predators? Tell Us Your Story - We'll help by offering you a discount. No tools required for assembly. Your hens are not expendable. We help keep them safer. OUR LITTLE CHICKEN SHOP - A small number of selected items just for you and your coop. *You may need a hammer to tap in the corner brackets. LCF Launches new product testing laboratory. 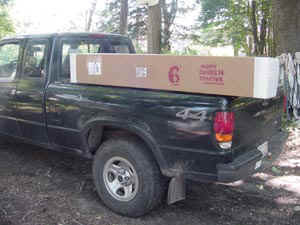 The Happy Chicken Tractor from our Little Chicken Factory comes to your house in a six-foot long shipping box and tips the UPS scale at a svelte 35 pounds. We build to order and for inventory now. 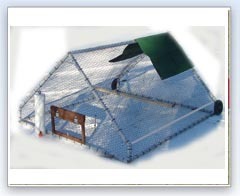 Our Happy Chicken Tractor is covered with durable poly-coated American-made chicken wire. If you order "frame only" you can choose your own netting. The door is included. Our Chicken Tractor includes a shade and rain cover. You can easily add a wood or metal roof. We include a feeder, perch and waterer. Let's be clear here. This whole thing is one man's idea carried out one step at a time. No big corporate stuff. Everything - except the wheels - is made in America. Gregg helps with the welding. A small factory in Massachusetts does the sewing. Another supplies the cardboard boxes. Our "factory" is an idea, not a building. The internet is a big help. So is Pete, our grumpy UPS guy. Kate, who raises blue-ribbon Silkies, has been a big help in many ways. And especially to all our customers and to the people along the way who reserved the right to laugh out loud and instead said, "Hey, that's pretty cool." End of Day Issues: Simply wheel the whole unit into the garage or barn (chickens and all) and close the door. Or, let the chickens out and shush them into their main coop for the night. Boxed and ready to ship. We are pleased to work with churches, missions and other groups to offer discount pricing that may help deliver our project to places and people in the world where predators are a problem and protecting a small flock would add to quality of life and to the security of a family's food supply. Visit EGGCARTONS.COM for poultry supplies and accessories. You can buy this item on-line by sending an e-mail to us HERE or you can call me at the factory at 978-724-6662 so that I can be certain to answer any questions and fill your order properly. If I'm not in, please leave a way to call you back. If you get stuck while putting things together, don't hesitate to pick up the phone and call for help. The basic sturdy structure (Sonny) is five feet wide and six feet long. The frame is made of aluminum square tube and our design affords full use of every inch of the covered ground. The Happy Chicken Tractor is less than half the cost (and weight) of many others. Door, perch, shade cover, wheels and drinker included. 8-Inch Wheels move our standard chicken tractor unit easily even in pretty tall grass. Perch Included. Call directly for order details, we'd love to chat. Send us photos of your flock if you like. Send your payment via Pay Pal. Allow 10-14 days for shipping please. Prices may change without notice. Contents of this website are Copyright 2015-16 and may not be used or reproduced without permission.